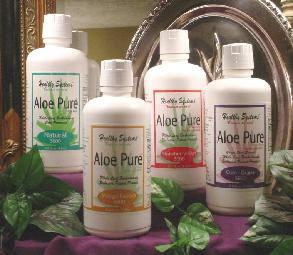 Aloe Pure� acts as a natural anti-inflammatory agent ..aids gastro-intestinal conditions. Anti-bactericidal ...antivirucidal �.antifungicidal ...aids digestion ...detoxifies ...boosts the immune system. Regulates cholesterol and triglycerides. Promotes cell division threefold. Relieves skin problems. Aloe Pure� Drink maximizes the availability of natural vitamins, minerals, amino-acids, enzymes, polysaccharides and over 200 various nutrients. Safe enough for children as well as adults. Good for upset stomach or hiatial hernia ...all gastro-intestinal conditions ...enhances the immune system. Suggested Usage: Take two to four ounces 1 to 3 times daily. Can be taken directly or mixed with water or juice ...chilled or room temperature. Disclaimer: This information is not presented with the intention of diagnosing or prescribing, but is offered for informational purposes only. In the event that the information is used without a Physician's or a qualified health care professional's approval, the individual will be diagnosing for himself. No responsibility is assumed and no guarantees of any kind are made for the performances or effectiveness of the items mentioned on this entire website. All should seek a professional's advice before diagnosing for themselves. © Copyright Systems 2001 NET, Inc. 2006 ...all rights reserved.